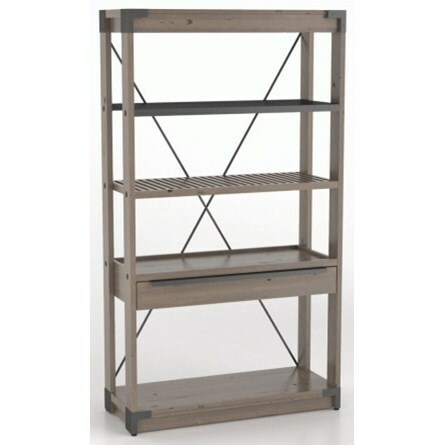 Spruce up a room with this customizable bookcase with metal accents, which offers an industrial style look. 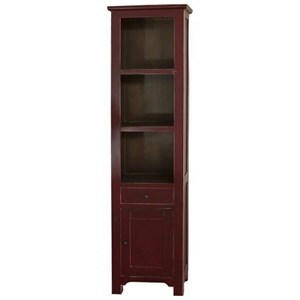 The versatile combination of open shelves and one drawer make it a perfect piece for dining storage or as a bookcase in an office or living space. Choose your preferred wood finish to make this piece your own. The East Side Customizable Wooden Bookcase With Metal Accents by Canadel at Zak's Home in the Tri-Cities, Johnson City, Tennessee area. Product availability may vary. Contact us for the most current availability on this product. Contemporary meets rustic with this affordable collection suitable for both country and urban environments. Choose from many customizable options to picking the legs and upholstery on your chair, to the table top of your dining table. The East Side collection is designed and custom-made from birch and hevea in North America with great and precise attention to detail. The East Side collection is a great option if you are looking for Rustic Contemporary furniture in the Tri-Cities, Johnson City, Tennessee area. Browse other items in the East Side collection from Zak's Home in the Tri-Cities, Johnson City, Tennessee area.